The end of the regular season is here and now it's playoff time. 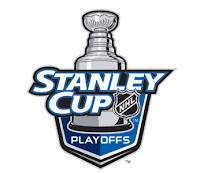 The Bruins head into the playoffs red hot and have to be the 1st or 2nd favorite to win the cup. My Flyers on the other hand have decided to slide into the playoffs on a 2 week slump....the combination of poor goaltending and turnovers in the defensive zone are not the way to winning in the playoffs boys. I may have to pick against them in the 1st round which brings me to DrunkNothings playoff coverage. It looks like myself and Mr. Booze are going to do some sort of pick 'em contest for the playoffs. We haven't finalized the details yet but we'll get everything posted before the playoffs start. Anybody have ideas on what we should bet on? Money? Food? Booze? Coffee? Parliament Lights? Any combination of coffee and Parli Lights works for me but maybe that's just my addictions talking. The good news is I didn't wind up in jail over that 'Copyright Infringement' notice so I guess I'm in the clear. The bad news (and I guess that depends on your perspective) this will probably be the last video for a while. So when these hockey videos started I figured the last week of the season would be a Best Play Of The Year type of thing which was posted last week. The first few weeks I never noticed the videos were getting cut off at the 5 minute mark so 90% of the Ice Girl vids were missing. Thankfully Chrissy noticed so I thought the best way to end the season would be a recap of all the Ice Girl photos and videos. So Chrissy this one is for you kid.....be sure you don't have any vacuums around, I wouldn't want you to hurt yourself.